The pilot of Child.org's Baby Box pilot programme ran in 2018, our first programme to aim to keep newborn babies safer. Encouraging and improving access to postnatal care is key to protecting more mums and babies - our Baby Box programme was designed to do that for mums living in informal settlements in Nairobi. Child.org handed out 483 baby boxes to new mothers in informal settlements ("slums") in Nairobi, Kenya. Baby boxes have been provided to new mothers in Finland for over 75 years. In Finland, a box includes everything you need for a newborn baby, all contained in a box, which is used as a cot. This baby box concept is used all over the world, from USA to Scotland, India to Mexico! However, the possible impact of this approach had not been thoroughly tested in a low-income environment. The Baby Box we distributed for our pilot programme was a much more simplified version than the packed box a mum would receive in Finland or Scotland. We were investigating whether the Box could encourage mothers to come back for their postnatal check-up after they had given birth. We would also find out if using the box as a cot would help the mother and the baby in the first three months of the baby’s life. The results are in and the report is out. You gave us the money to run a Baby Box programme, here's what we achieved with it. Baby Boxes have been making news in the UK for a few years, with research and debates ongoing into how they help families in Scotland and Finland (or shoppers at Lidl). But there's been precious little research into whether this innovative intervention might be useful in a low-income country like Kenya. Our small pilot programme provides a glimpse into their potential. The Baby Box Pilot was Child.org's first mother and newborn programme, and the first delivered direct by our Team in Nairobi. It was also funded by our first ever Christmas appeal - £6000 raised from individual donations from UK supporters and matched by the Bush Hospital Foundation. Between June and December 2018, Child.org used that money to deliver 483 specially-designed Baby Boxes to mothers with newborn babies living in informal settlements ("Slums") in Nairobi County, Kenya. Each box included a mattress, two sheets, a cellular blanket and a mosquito net, and was printed with safe sleeping advice. 96% of mothers accessed postnatal care services following the birth of their baby, compared to only 15% at baseline. The project saw an 81% increase in women and babies accessing life changing services. 21% of babies checked during their postnatal care consultation were diagnosed and treated for an umbilical cord infection. That’s 122 babies that were treated for a life threatening infection. Based on the improved access to postnatal care, that’s 98 babies that had their infection detected earlier (as a result of the mother going for postnatal care earlier in order to collect the Box.) Cord stump infection is one of the causes of blood infections such as sepsis and tetanus. These contribute to17% of newborn deaths in Kenya. 95% of mothers that received the Box are using it as a place for their baby/babies to sleep either during the night or during the day. Before the programme, just 7% of mothers knew that the safest position for a baby to sleep is on their back. After the programme, 43% of mothers knew this. 1. Child.org worked directly with the the Ministry of Health on this programme, and when we discovered gaps in provision of postnatal care - we ran our own training session with staff and volunteers. We also made sure we were using monitoring and evaluation tools and measurements that would work with the data used by the Ministry of Health, so we could share and compare data easily. 2. We initially registered 478 mothers, reserving 22 of our 500 boxes in case any of the mothers had multiple births. This turned out to be prudent because nine mothers in the project had twins. Only one of these mums had a scan, and her scan was inaccurate - so none of those mothers knew they were expecting more than one baby! “It has helped me a lot, especially the mosquito net from preventing diseases by malaria.” - Gentrix, mother of twins, Prince and Ashley. 3. In an early focus group, we showed local young mums a prototype of the box and they were shocked, saying that it looked like a sanduku/coffin! To ensure mums wanted to collect and proudly use the box, it had to look like a beautiful crib for a baby, so we worked with illustrator Jaqueline Fryers to create beautiful boxes in a cost-effective black and white. The boxes were printed and manufactured in Kenya. 4. Mums told us that the boxes were most useful as a safe place to put the baby during the day, while they were working or cleaning up. Imagine the impact on your day-to-day life when you're given a safe place to put your baby down, in an environment where that wasn't possible before. Our report outlines the whole story of the programme: the challenges we faced, the things we learned and the families we met. 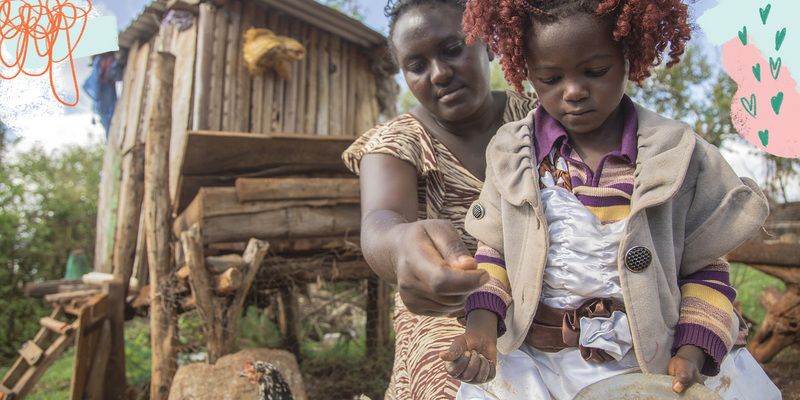 Right now, Child.org are fundraising to deliver our next mother and baby programme in Kenya. Our pregnancy support groups will work with new mums in a remote rural environment, where Baby Boxes are less suitable as an intervention, but we will be providing new mums with a pack of baby essentials as an incentive to attend. This new programme will also link mums with health services that will make their babies safer. The Team Mum appeal is raising funds for this right now, and if you donate before 30 April your donation will be matched by the UK government. Considering the significant gaps we found in the provision of postnatal care while we were delivering this programme, we’re keen to keen to increase the scope of our potential impact on postnatal care rates in Kenya. We also want to capture more data on the mental health of new mothers. We conducted a small survey of women using the Edinburgh Postnatal Depression Scale during the endline evaluation and found that 36% of mothers were found to have symptoms of depression. Mental Health is a much-hidden topic in Kenya and postnatal depression is not discussed with mothers at any time during pre and postnatal care. We want to address the deficit of data regarding safe sleeping for infants living in informal settlement environments in Nairobi and beyond, through academic study of safe sleeping studies in collaboration with universities in the UK and in Kenya. There is huge scope to find out more about whether sudden infant death syndrome (SIDs) really is leading to more baby deaths in Kenya, and assessing what interventions could save more lives. If you like what Child.org are doing to support mums and babies, please consider joining Team Mum Monthly. Your donation will help us reach mums and babies who need our help, and we'll keep you up to date with all the cool stuff you're helping us to do. PLUS if you join Team Mum Monthly before 30 April 2019, your first three months will be doubled by the UK government, with this funding going towards our new pregnancy support groups in rural Kenya. A Baby Box is an inexpensive alternative to a crib made with cardboard material. The concept originated from Finland in the 1930s initially targeting women affected by poverty in order to increase attendance of antenatal care sessions and skilled delivery. The programme in Finland was extremely popular and since the intervention was introduced, the infant mortality rate in Finland has decreased from 65/1000 to 2.4/1000 (BBC, 2013). Of course this success cannot solely be attributed to the Boxes; they were utilised as an engaging and useful intervention for mothers whilst further investments were made into maternal health which ultimately led to better health outcomes. That said, they have proved an effective vehicle through which to provide potentially life-saving equipment to new mothers, improved uptake of maternal health services and to disseminate vital health information. Baby Boxes are now given as incentives in Scotland, some states in the U.S, parts of South Africa and Mexico among other countries, but there are few projects in developing countries, and where they are, little data is being collected on their efficacy in a low-income setting. What did we want to learn through the pilot? 1. Where were maternal services a particular challenge for women in Nairobi? 2. Which services were most in need of improvement? 3. What value could the box have in and of itself? To read more about the evidence we used to design the programme and the evidence we collected through our surveys, download our pilot programme report, below. 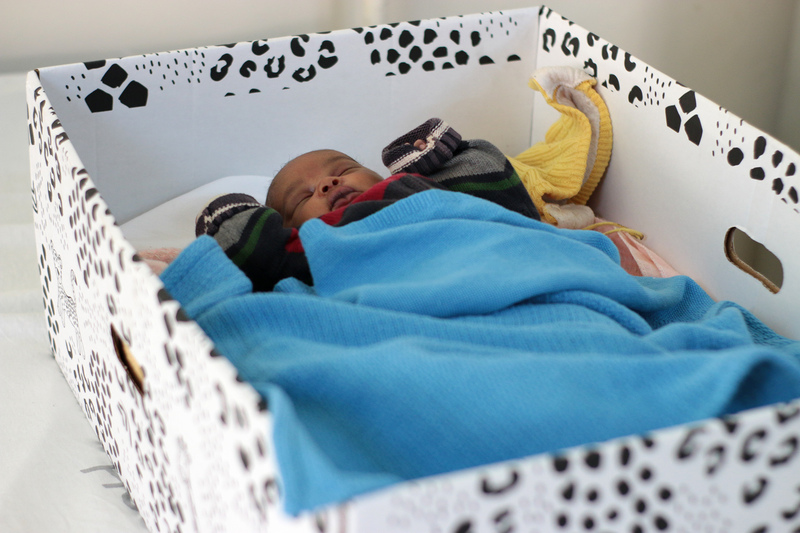 The extensive research we conducted when designing this programme indicated that the perfect place to test the efficacy of baby boxes was in certain areas of Nairobi, Kenya. Here, there is a high proportion of mothers who are severely affected by poverty and living in urban informal settlements ("slums"). Infant morbidity rates are high, so it's an area that needs more protection for the health of newborns and their mums. All our participants were mothers living in Kangemi and Westlands in Nairobi, where most mums fail to attend any postnatal care sessions at all. Our research indicated that this group could benefit hugely from some extra, specifically targeted support, particularly around the safety of a newborn. In our pilot programme, Child.org partnered with two health facilities to hand out Baby Boxes. During their final antenatal visit to the clinic, mothers were given a little baby hat and a voucher to collect the full Box. They received the Box when they returned to the health clinic, with the voucher, for their postnatal mother and baby check-up. In this way we tested to find out whether the Box worked as an incentive for the mothers to come back for their postnatal care check-up. work alongside a greater understanding of the needs and opportunities within maternal health programming. The project design included multiple surveys to inform us of the situation in the region we identified, the perception of the interventions we presented and the change they made. We conducted three key surveys within a six month period: the baseline, the midterm and the end line evaluations. We also engaged with the Monitoring and Evaluation department from the Nairobi County Government to help inform us of the Ministry of Health’s processes and to assist us in developing project indicators that aligned to the ministry’s own. This ensured we could share findings easily and contribute to the Ministry of Health’s own objectives in Maternal Health. The department also shared their knowledge and experience of the digital data collection tool used by development partners; Kobo Toolbox. This tool allows for easy data collection, sharing and analysis and has been adopted by the Child.org Programming Team across multiple programmes as a result. For further information please don’t hesitate in getting in touch with the team to discuss the programme. To request any of our research on Baby Boxes, please email programming@child.org.